I am so excited to have finally started my first podcast! I have thought about adding podcasting to my blog for at least a year now, and I just decide to jump in with both feet and do it. Unfortunately, I am unable to keep up with a weekly podcast, so it won't be as regular as I like. When I do post, it will be on Tuesday mornings. You can follow here, at my podcast host, Podbean, or on iTunes. Each of the links below will take you to the blog page for each podcast. 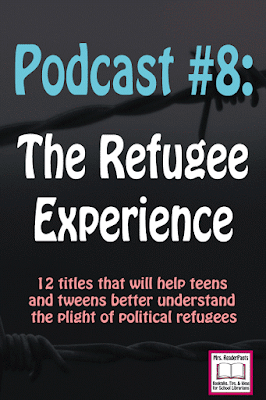 The pages include the podcast as well as a list of all books, websites, and other materials referred to in the podcast. I would love to hear your feedback, and reviews in iTunes will really help me spread the word to other school librarians and teachers. Likes and follows are also greatly appreciated! 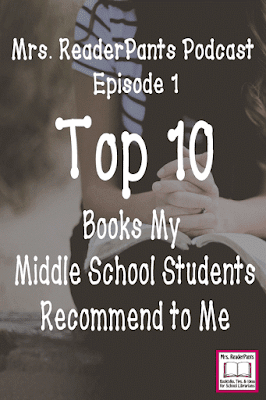 "Top 10 Books My Middle School Students Recommend to Me"
This is my very first podcast, posted on December 20, 2016. In this episode, I introduce myself and what I plan to do with my podcasts. Then, I describe ten books my students recommend to me to read. Since I am usually the one recommending books, this is a nice switch for my first podcast! "20 Graphic Novels Middle Schoolers Love!" 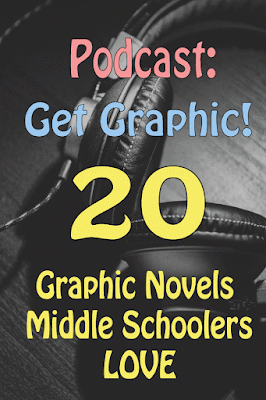 Today, I discuss 20 graphic novels that are most popular with my middle schoolers as well as award-listed graphic novels I need to read and promote better in my library. All the books and resources mentioned in the podcast are also listed in this post. 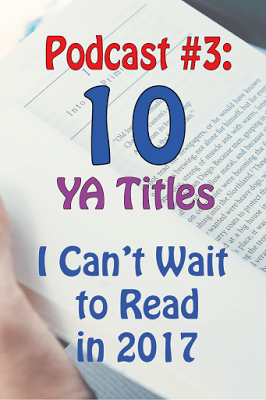 "Ten YA Titles I Can't Wait to Read in 2017"
In today's podcast, I discuss setting reading goals for 2017 and ten new YA titles to get excited about in January and February. 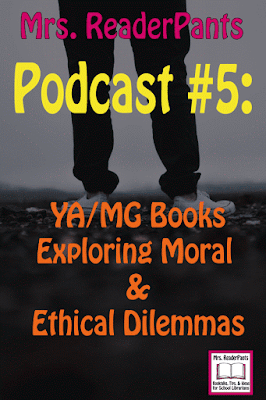 "15 Free Verse Novels to Inspire Your Middle Schoolers"
"YA/MG Books Exploring Moral and Ethical Dilemmas"
Today's podcast features titles about teens and tweens facing complex moral and ethical issues. I decided to focus on moral dilemmas after having a very interesting "What would you do if..." discussion with a Year8 class (7th grade). 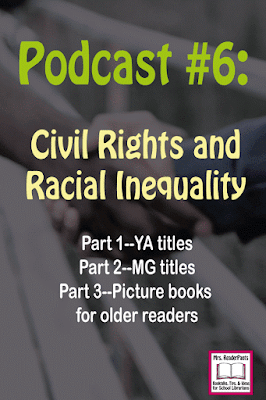 "Civil Rights and Racial Inequality"
Podcast #6 is an extensive look at books about civil rights and racial inequality. This started out as only one (very long!) podcast, but I went back in and separated it into three shorter podcasts, separated by reading and interest level. I think this will be easier for librarians and teachers looking to isolate the titles they are most interested in. 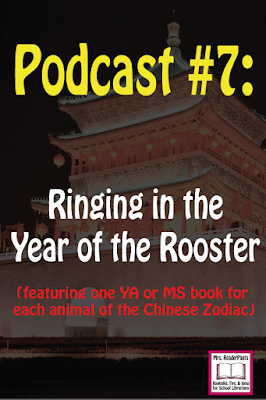 "Ringing in the Year of the Rooster"
Today's booktalk features selected titles to represent each of the 12 animals in the Chinese Zodiac, introducing each through the Chinese story of The Great Race. All of these titles are for teens and/or tweens, but I also include two picture books and some read-alouds that would work well with elementary students. Xīn nián kuài lè! Happy Valentine's Day! Today's episode has nothing at all to do with love or sappy romance. You're welcome! 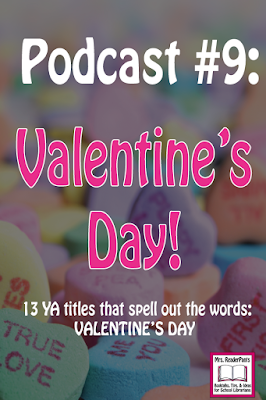 Instead, today's booktalk podcast is YA titles that spell out VALENTINE'S DAY. This allows me to feature a lot of different titles from different genres. 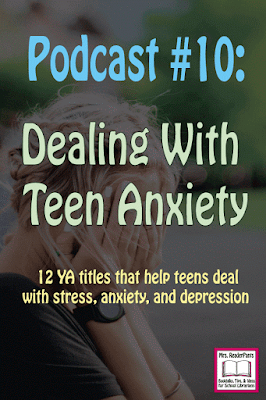 Anxiety is a real issue for many of today's teens (and adults), myself included. I know I try so hard to be perfect and "on top of everything" and smiling and happy, when often, I'm barely keeping my head above water. It's all an illusion! Pay no attention to that stressed-out librarian behind the curtain! "Books for Readers Who Love...The Flash"
Ready for a super-fun episode today, full of whizzes, bams, and pows? 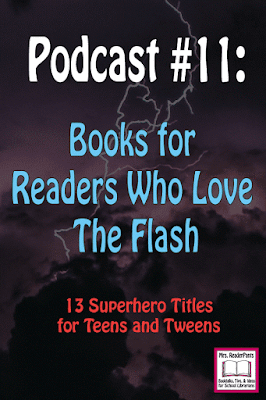 Today's episode is YA and middle school books for readers who love watching the TV series The Flash. My family loves The Flash, and I'm certain they will love many of the books on this list! "Books for Readers Who Love...Seinfeld"
Today's episode pays tribute to probably my favorite TV show of all time...Seinfeld! 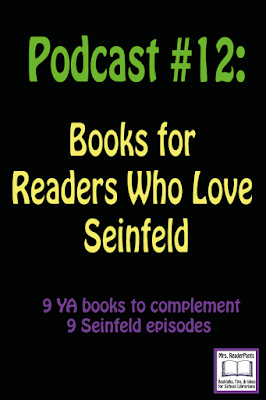 If you love Seinfeld, you are going to LOVE this episode, where I pair one YA book for each of nine favorite episodes. If you don't love Seinfeld, don't worry. This podcast is still focused mainly on fantastic books--the Seinfeld episodes just tie it all together. Idea for a podcast episode: the most popular novels in verse in middle or high school. (I'd love it!). So far, I've enjoyed and used both of your first podcasts. That's a great idea! I actually just did a booktalk with my 7th graders about free verse, and they went wild for it. I had to order another copy of One by Sarah Crossan because I had so many holds on it! 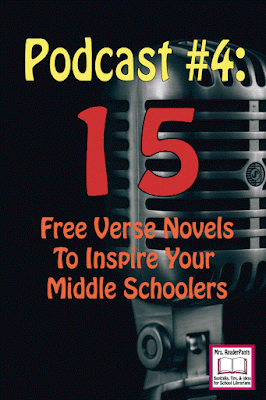 I will add free verse to my upcoming episodes--thank you for the idea! Are you planning on continuing your podcast? I listened to you first on Modern Mrs.Darcy and LOVED all your ideas. I am not a librarian, but an ELA teacher of 7th grade and I have a large classroom library. I bought your What's your Genre quiz and use it every year with my classes. YOur podcast really gave me some great book ideas I hadn't heard of before. Thank you for asking! I am so glad you are finding the podcast and the What's Your Genre Quiz useful! I have pressed an extended "pause" on the podcast, but I do hope to pick it back up later in the summer or fall of 2019. It was a LOT of work to put together--way more than I ever imagined--and I just could not manage it as a full-time librarian. But I'm leaving my current position in June in the hopes of making my blog, TPT store, and podcast my full-time business. Hopefully, I can make the podcast stick this time!